While there are an infinite number of choices when selecting an engagement ring, the most noticeable aspect of the ring is the stone. Engagement rings can be fashioned from any number of precious gemstones like rubies, emeralds, and sapphires, but the classic engagement ring gemstone that most women want is the diamond. Diamonds have become the standard and timeless choice for most brides in recent times because of their elegance and brilliance. No other gem sparkles with the intensity of a diamond and has the ability to captivate all those who look upon it. When choosing a classic engagement ring, the diamond engagement ring is the only true classic. When it comes to diamonds, there are four characteristics that determine the price of the stone. Referred to by industry insiders as the four C’s, they are carats, color, clarity, and cut. Carats are a unit of measurement for the weight of a precious stone. In nature, large stones are rare, so naturally, the more a diamond weighs in carats, the more it will cost. Despite popular belief, carat weight alone is not the sole determinant of the final price of a loose diamond. The next characteristic that all diamond shoppers should be aware of is color. Diamonds are made of pure carbon, which is normally black. Deep within the earth under tremendous pressure and heat, carbon atoms are squeezed together to form a clear, crystalline material — diamond. Ideally, diamonds are clear and perfectly transparent. These diamonds are also called white. As the quality of the color of a diamond goes down, the white, clear color gradually transitions to shades of pale yellow. In the diamond industry, the color of a diamond is graded on a scale from D to Z.
Diamonds with a color grade of D, E, or F are classified as being colorless and are the most expensive stones. Flawless diamonds with a color grade of D can fetch prices exceeding $10,000 per carat, while stones with lesser color quality can sell for as little as a few hundred dollars per carat. Another subcategory of color is fancy colored diamonds. These diamonds contain impurities that cause them to exhibit other colors besides white, such as red, blue, pink, green, and orange. Because the stones are quite rare, they command premium prices on the market. After color, the next most important factor in choosing a diamond is the clarity. Clarity is a measure of how clear the stone is. Stones that are very clear and free of internal flaws called inclusions are the most prized. Diamonds that have more inclusions are less transparent and cost less money. Finally, the last condition that determines the price of a diamond is the cut, which describes the shape of the stone and how well it was crafted. In recent years, the round brilliant diamond has become “the” classic engagement ring. It is by far the most popular cut, representing over 75% of the diamonds sold today. The art of stone cutting dates back to the Renaissance and has evolved through time as materials and tools have advanced. Round brilliant cut diamonds were introduced in the early 1900s when master jewelers refined cutting techniques and theories to maximize the transmission of light through the gemstone. Round brilliant diamonds are the best cut of diamond for maximizing the amount of light that passes through the stone, making them the most brilliant and fiery cuts available today. These diamonds have 58 facets, each of which must be cut precisely to ensure that the diamond sparkles as much as possible. When shopping for a round brilliant diamond, buyers should look for stones that have a color grade of at least G and a clarity that is at least slightly included. Another aspect to look for is the depth of the stone and the table size, which are measured as percentages. The depth of the stone is the height of the stone from the base to the top, which is called the table. A stone that is too deep will appear smaller than it is and a stone that has too large of a table will appear glassy and fake. Ideal depth size ranges between 57-65%, while an ideal table size for a round brilliant cut diamond is 51-64%. Round brilliant diamonds can be placed in a number of settings, but each setting requires at least four prongs to keep the stone in place. After round brilliant cut diamonds, princess cut diamonds are the next most popular cuts of diamond. Unlike other square or rectangular stone shapes, the princess cut diamond radiates light almost as well as the round brilliant. The princess cut diamond is a relatively new innovation in the diamond industry, having been developed in the 1980s. Jewelers were looking for ways to cut diamonds in such a way that they could be square shaped, yet retain the sparkle of the round brilliant cut. The princess cut is either square or octagonal in shape, depending on whether or not the stone cutter decided to cut off the corners. Diamonds that have been cut in this style produce very little waste from the original stone and are popular with jewelers. Princess cut diamonds have over 100 facets as opposed to 58 for the round brilliant cut. As such, they are forgiving in that they can hide many of the flaws than an imperfect stone may have. This makes selecting raw diamonds for a princess cut ring more economical. Shoppers can choose a diamond of lesser quality and use the savings to buy a larger stone or a better band for the ring. For couples on a budget, the minimum color grade of a princess cut diamond should be I and the clarity should be at least slightly included. The table size of a princess cut diamond ideally lies between 58% and 77% and the depth should be between 56% and 84%. Princess cut diamonds, like round brilliant diamonds require a setting that has at least four prongs. For women who want a square shaped ring, but like the fire and sparkle of a round brilliant diamond, the princess cut provides the ultimate compromise. For women who want a different, yet stylish look, the classic emerald cut diamond may be the right choice. Emerald cut diamonds are rectangular shaped diamonds that have few facets. The shape originated from the process originally developed to cut emeralds. Unlike round brilliant diamonds, emerald cut diamonds have less than half of the facets. This makes them less flashy than brilliant or princess cut diamonds, but this quality appeals to many women who do not like to wear flashy jewelry. One good thing about an emerald cut is that the long lines make the stone look larger than it really is. Another positive aspect about the emerald cut is that because they are not as popular as brilliant or princess cut diamonds, their prices are lower for the same size and quality stone. For example, an emerald cut stone of the same weight, color, and clarity can cost as much as 20-25% less than a round brilliant or princess cut diamond. Emerald cut diamonds require higher quality diamonds to be used than princess cut diamonds because of the large, flat surface of the stone that will show any internal flaws. For an emerald cut diamond, buyers should look for stones that have a color grade of at least G and a clarity of at least very slightly included. Finally, the table size should be between 58 and 69% and the depth should be approximately the same. Women who like to stand out from the crowd will love the emerald cut diamond. A slight variation on the emerald cut diamond is the Asscher cut. The Asscher cut is a fashionable cut that resembles the emerald cut except that it has a smaller table and a stepped slope. The stepped cut reflects more light than a normal emerald cut, making Asscher cut diamonds more fiery and brilliant than emerald cut stones. Asscher cut diamonds require a four prong setting. The prongs should be thin to allow more light into the stone. The classic engagement ring consists of a single solitaire stone set on a band. The best looking bands for diamonds are white metal rings, which compliment the purity and clarity of the diamond. Good choices include platinum, white gold, and palladium. 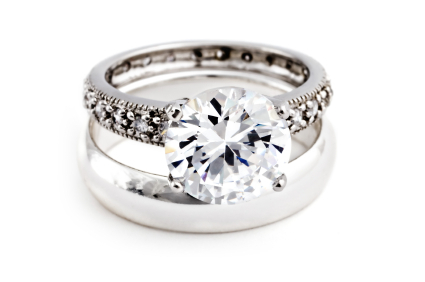 Three stone settings are also popular and allow brides to accent their central diamond with other stones. For example, one popular choice is to select more diamonds as companion stones. Other women choose to include birth stones or other precious gems as secondary gems in the setting. Whatever the stone, it’s important to make sure that the two companion stones match in order to properly frame the central stone. Finally, a woman can choose to accentuate her engagement band by purchasing a pave diamond band that has small diamonds embedded around the circumference of the ring. Quality diamonds and engagement rings can be purchased at any retail or wholesale jeweler or online. When purchasing diamonds, it’s important that the diamond have all the proper certification and papers regarding its grading. The round brilliant, diamond solitaire on a platinum band is “the” classic engagement ring that most brides want and dream about. It is iconic and timeless. However, in recent years, trends have been changing, with more women electing to choose other styles and shapes of diamonds that are sure to be the classics of the future. Could you please tell me where this ring on this page or the photo of this ring on this page came from? Thank you!